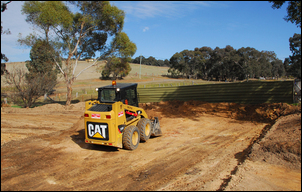 As covered in previous parts in this series, the shed pad is levelled and council approval has been gained for a 12 x 8 metre shed. Now it’s time for concrete! Unless the site is dead-level, earthworks will need to be carried out before the concrete slab can be poured. 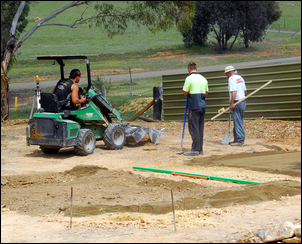 These earthworks will potentially have a major impact on the design and cost of the required slab. In the case of my site, the required area of flat ground had been developed through ‘cut and fill’. This is where the upper slope is removed (the “cut”) and the resulting loose soil dumped on the lower part, so building it up (the “fill”). The fill is compressed as much as possible, but because it is newly-placed soil, it will still squash down over time – especially with a shed sitting on top of it! Because of this variation in the characteristics of the underlying material, concrete slabs placed on this type of surface need to have piers or pillars cast into place. These pillars need to go down into the original soil. Therefore, on a cut and fill site, modifications need to be made to the standard plans for the slab supplied by the shed kit providers. In the case of the shed that I was sourcing, the standard plans showed that the slab requirements comprised a thickness of 100mm, with thickening blocks 350 x 350 x 200mm in depth placed under each of the 10 shed uprights. 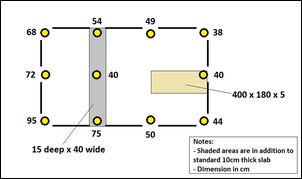 (The plan shows the blocks as being 300mm deep but that includes the 100mm depth of the slab itself.) Steel reinforcing mesh is used across the main slab but not in the thickeners. But all that’s for when the shed is placed on ground that is already level and so has not needed any fill. To cater for the fill on this site, the thickening blocks needed to be extended downwards, so forming pillars. The length of the pillars had to be set so that their penetration into the original soil remained at 200mm. That was the requirement - but obviously going a bit deeper again would be no bad thing. To achieve the required penetration of the pillars, the company I contracted to do the concreting used a mechanical auger. This machine produced circular cross-section holes, 500mm in diameter. The area of the pillars was therefore just under 2000 square centimetres – 60 per cent bigger than required by the shed engineer! Furthermore, despite the maximum depth of fill being only about 400mm, and so the maximum required pillar depth being 600mm, the pillar depth on the area of greatest fill was actually 950mm. The shallowest pillar, placed on area of no fill, was 380mm – nearly twice as deep as required. In short, the pillars cast into place were much larger in diameter, and deeper, than actually required. The slab strengthening for a hoist is highly recommended for anyone building a home workshop that will have sufficient internal clearance to allow a hoist to be used. The minimum thickness of concrete specified for a two-post hoist is typically 125mm (5 inches), thicker than the 100mm (4 inches) usually employed in shed slabs. 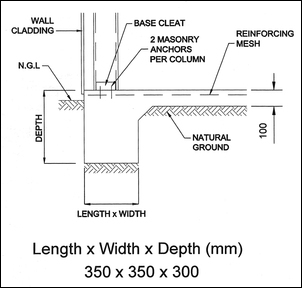 If the extra thickness is incorporated when the slab is first poured, the additional cost is quite small. However, if the slab has to be cut, material excavated, and the section repoured, the cost will be high! When taking the latter approach, the steel reinforcement will also not be continuous throughout the slab. The strengthened slab for the hoist was formed by excavating to a further 50mm depth over a 4.0 x 2.8 metre area. In addition, an extra layer of steel reinforcement was used in this area. The result is a 150mm (6 inch) thick area of double reinforced concrete, perfectly keyed into the concrete around it. The provision for the mezzanine is not so straightforward. I expect at some stage to build an elevated 8 x 4 metre floor at one end of the shed, either a ‘proper’ mezzanine (office, etc) or just an elevated area for storage. To cater for this development I had another, central, pillar cast into place and a thickened footing, 150mm deep and 400mm wide placed where an internal wall might go. However, depending on the structure used, these foundation provisions may be insufficient. To be sure of the requirements, the mezzanine would need to be fully engineered at the time of shed construction. Prior to the concrete being laid, the area was covered in ‘crusher dust’ (a fine sand that’s a by-product of crushing works at quarries) and was levelled using a laser and small digger. The required volume of concrete was 12 cubic metres. Note that this figure compares with the 9.6 cubic metres that would have been required for the slab alone (ie not including the pillars, hoist strengthening or provision for an internal wall). 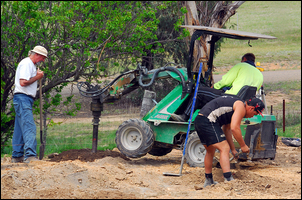 The concreter provided a large and experienced team – five men. These people worked quickly and professionally, using a laser level to smooth marking pads at the right elevation and then levelling to match these pads. The concreters probably won’t tell you, but you should ensure that the concrete cures as slowly as possible. 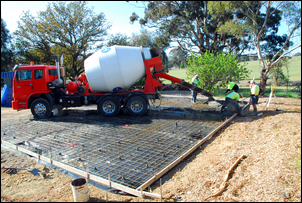 A fact sheet available from the Cement Concrete & Aggregates Australia website shows that, if allowed to dry out continuously in the air, the compressive strength of concrete is only 40 per cent of that achievable if the concrete cures slowly by being kept continuously moist. 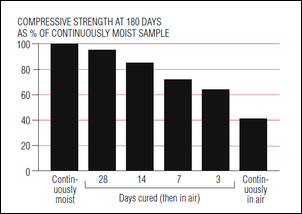 Furthermore, as this graph shows, keeping the concrete moist for even three days after laying makes a marked change in compressive strength – lifting it from 40 per cent of what is possible to 65 per cent of achievable strength. 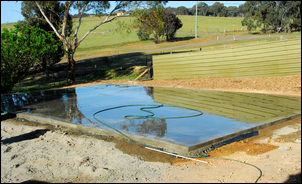 If the concrete can be kept moist for 28 days – even better! The leaflet states that this slowing of the curing rate can be achieved by a number of methods, including enclosing the concrete in plastic sheeting and by spraying with water. However, you don’t want the concrete drying out and then being rewetted – it needs to be wet all the time. Concrete that is allowed to dry out quickly also undergoes considerable early age drying shrinkage. Inadequate or insufficient curing is one of main factors contributing to weak, powdery surfaces with low abrasion resistance. I chose to use a hose and kept the concrete wet for about a week. Minuses: Never underestimate the cost of the concrete slab – it adds up! Note: the concrete trucks and concreters had a two-way travel distance of about 80km to the site.